Arthridia Herbal Extract, plus, our FlexaSure Cell Cleanse and Joint Hydration formula can allow stiff joints to move freely. Why Do I Use Both Primalix Arthridia and FlexaSure As A Combination? Because the 2 used in combination with each other can bring tremendous success. EACH has a different function in supporting your dogs joint comfort! Primalix Arthridia is unique as a pain killer and anti-inflammatory. Unlike NSAIDs used in conventional medicine, Primalix Arthridia reduces pain and inflammation through pathways that do not cause digestive problems or other negative side effects. FlexaSure does not replace glucosamine and chondroitin for increasing cartilage. Instead, it washes away cell-bound allergens that appear to the immune system as foreign invaders, setting off the auto-immune response by mistakenly attacking one's own friendly cells. FlexaSure then plumps up the cushioning in stiff joints, improving mobility and range of motion. Primalix Arthridia is an herbal extract (dietary supplement) for the natural relief of pain and inflammation. It is one of our Functional Food Drops that you conveniently add to any dog food. A dropper or two can do what no pain pill on earth can do. What Are The Ingredients In Primalix Arthridia? Arthridia’s formula is elegant in its simple spectrum of herbs, including Rehmannia Root, Bupleurum Root, Sarsaparilla Root, and Ginger. Weird sounding names, right? But let’s take them one at a time and see how they bring natural relief of pain and swelling to your dog’s aching joints! Why Is Arthridia a Big Deal? Our legendary formula combining only USDA Certified Organic herbs is a big deal because, as I said before, “A dropper or two can do what no pain pill on earth can do.” This stuff could make pain pills obsolete. How? Each herb in our formula has undergone extensive clinical trials (both human and animal models) proving to reduce arthritis pain and inflammation as effectively (or more) as non-steroidal anti-inflammatory drugs (NSAIDs) like ibuprofen and aspirin – even acetaminophen. So Why Do I Need FlexaSure? 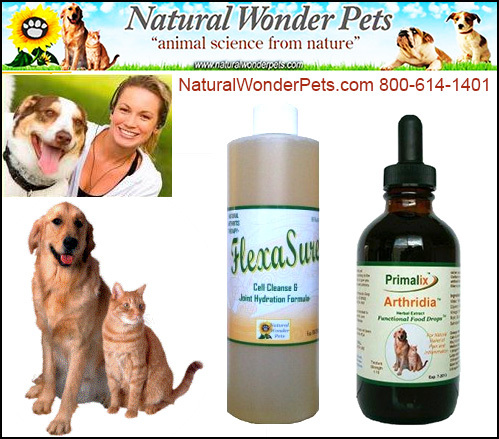 A product that rescues our best friends from the tortures of dog arthritis pain and inflammation is truly a godsend. But it solves only HALF the problem! We here at Natural Wonder Products refuse to stop short of anything but total victory. We’re dog lovers, too, you know. And that’s why we formulated FlexaSure Cell Cleanse & Joint Hydration Formula. FlexaSure is a molecular world of wonders. You simply add a teaspoon or so (depending on your dog’s weight) of this pleasant tasting liquid to your dog’s food once or twice a day. That’s it. No awkward pills to swallow. Its proprietary, triple-stage formula works at the cellular level to cleanse, re-hydrate, and fortify damaged tissue in a truly elegant synergy. Is It True That FlexaSure Also Contains Hyaluronic Acid? YES! Our final ingredient in FlexaSure is a protein component of connective tissue called hyaluronic acid (hy•a•lu•ron•ic acid). This natural wonder is a water-holding molecule found in the synovial fluid of your dog’s joints, cartilage and skin tissue. It fills up the space between cells in the connective tissues and provides the cushioning that allows joints to bend and flex. It has no known side effects. Order Primalix Arthridia and FlexaSure Today! Your dog deserves a treatment that works! He or she deserves a product that is capable of doing what it promises. Primalix Arthridia and FlexaSure not only offer full support for joint health, but actual relief for joint pain. Together they are truly a Dynamic Duo of super heroes— saving your dog from unnecessary pain and mystery. Call us today and let us help you— help the dog you love!